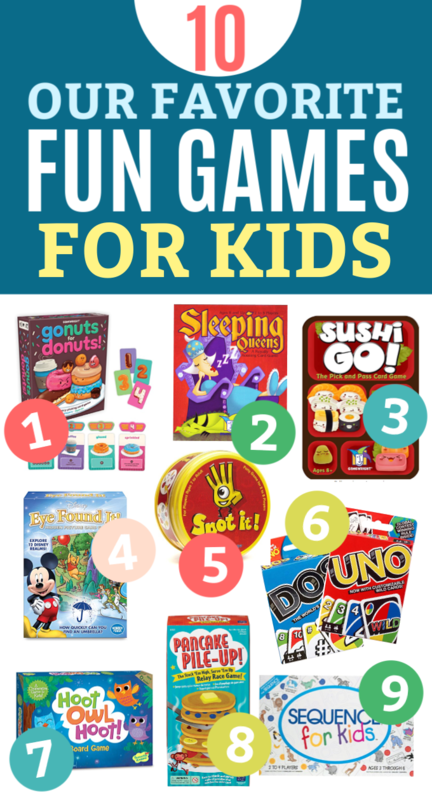 Our Favorite Games for Little Kids – Our top games for young kids. Perfect for birthday or holiday gifts, rainy days, summer nights, and more! Summer in Arizona is a funny thing. On one hand, it’s the PERFECT time to be in the water–pools, splash pads, resorts, even lakes and rivers. On the other hand, it’s a TERRIBLE time to be outside if you’re not in water. With temperatures well into the 100s for most of the summer months, it’s too hot to spend much time at parks or playing in the backyard. Which means that even though it’s bright and sunny outside, we often get a lot of “cabin fever” feeling cooped up in the summer. We do a lot of outings, whether that’s extra long library runs, regular errands, or visits to fun places like museums and exhibits, but there’s also just lots of time where we’re home inside. In the last 2 years, Milo and Sophie have fallen in love with all kinds of games, so I thought today I’d share some of our favorites. These make great birthday or holiday gifts, and can help you get through hot summers, rainy days, or cold winters that keep you inside. 1. Go Nuts for Donuts! This is a relatively new find for us. We’ve played it for a few months and it’s easy enough that Milo (5) and Sophie (7) can keep up with no problem. It’s a bidding game. Each donut has a different value or action. Players “bid” on which donut card they want to take each round. If two or more people choose the same donut, nobody gets it! The person with the most points at the end wins! I’ve mentioned this game about a dozen different times, but it seems there’s always someone who hasn’t tried it yet. This game is marketed to ages 8+, but was designed by a child so it’s really easy to understand. My kids (who aren’t game prodigies) could comfortably play and follow the rules by age 3. The rounds are fairly quick and the rules are easy to follow. 3. Sushi Go! and Sushi Go Party! This is a REALLY fun game. Milo and Sophie played with a grown-up for the first 2-3 rounds, but everyone’s been able to play by themselves ever since. Michael and I play with just the two of us fairly regularly, and it’s a really fun game to play with a group. The original version is a great place to start, but if I could only choose one, I’d choose Sushi Go Party! (the expanded version) since it’s got so many variations and ways to play to keep it interesting. This game is adorable and very low-stakes, which makes it perfect for your littlest players. Let everyone play by themselves, or break into teams and try to hunt for the hidden items before the other players find them. Rounds go quickly and it’s VERY easy to play. Another look-and-find game, though this one is a little different! My mom gave Spot It! to us early this year and it’s the game my kids reach for over and over when we only have a few minutes to play. It’s quick and it’s another I-spy game. There are several ways to play, but our favorite is “Hot Potato” where you’re trying to quickly give your cards to someone else and end up with the fewest cards. PS – It also comes in a cute Finding Dory edition and tons of others that are really fun. I’ve been playing Uno since I was really little, and my kids have loved that game since they were about 3. It’s easy to follow along with and fairly quick. (We sometimes take out the Wild Draw 4 cards or make them regular Wilds to speed things along). Dos recently came out and it’s a fun twist on Uno! We got it in April, and it’s been fun. It’s a little more complicated than Uno, but after a practice round or two, you get right in the groove. If I was going to choose one game to recommend to introduce games to your kids, this would be it. I prefer this to Candy Land or Chutes and Ladders, etc. Why? It’s cooperative, which means everyone is working together. (It also means no one can fight about winning or losing!) Your goal is to get all the baby owls to the nest before the sun comes up. It’s a great way to practice using VERY basic strategy and teamwork. This is a cute, colorful game we all really enjoy. It’s nice and simple (the target age is 3-6 for beginners). Your aim is to claim 4 spots in a row using the cards you draw. Players can block each other or use basic strategy to play. We learned about this game in occupational therapy–it’s great for hand-eye coordination, motor skills, following directions, cooperative play, etc. When you’ve got kids with extra energy, this is a great one to pull out. It’s a relay-style game, where you must build a pancake stack to match the cards you draw. You can play in big teams or with just 2 players. 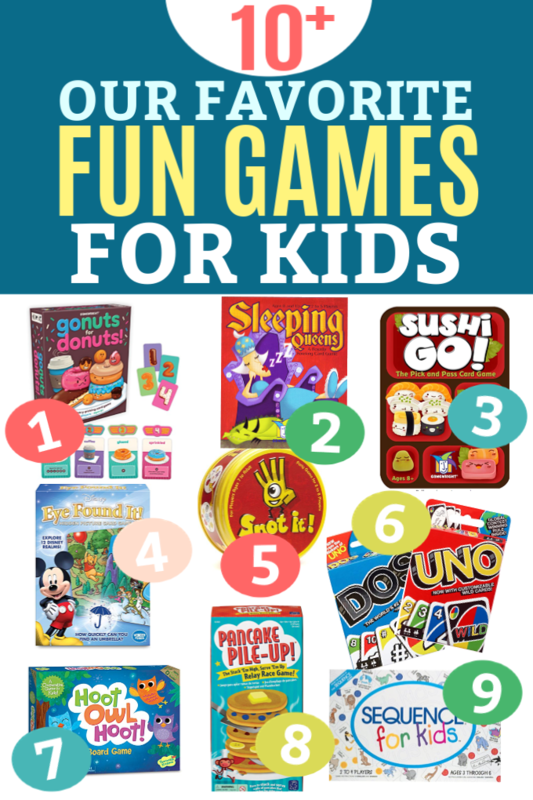 What are YOUR favorite games for kids? Any new ones I’ve missed? Shout them out below! p.s. Looking for more ideas to keep everyone busy this summer? 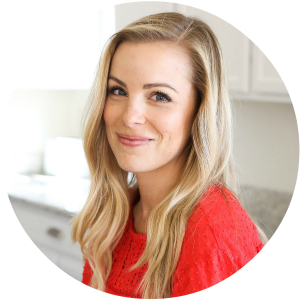 Try this post with 20+ EASY Recipes to Make with Kids. I think go nuts for donuts might need to find it’s way into our house! Our kids love sequence jr right now though! I hope you guys love it! After a practice round or two, it’s been an easy favorite at our house! We’ve not tried most of these. Fun!! Sorry was a tricky game to learn, but now the kids love it. We also play a lot of connect four. I also taught the kids how to play traditional solitaire with cards. They really like that and can play by themselves. Like you, I played Uno as a kid and we now play together. My kiddos are 16 and 13 and we still love family game night. When they were young, one of our most favorite games – the one that really got them hooked on games – was Take Off!. They still like to play when younger cousins come over. Right now we like Ticket to Ride, Catan, and Carcassonne. I just looked it back up myself to see if it is still available. I noticed it says Ages 10 and up, but we started playing MUCH younger. I think it is why my son has always been so good at geography!